N-Heterocyclic carbenes (NHCs) are now well-established organocatalysts for a large number of asymmetric and non-asymmetric transformations. 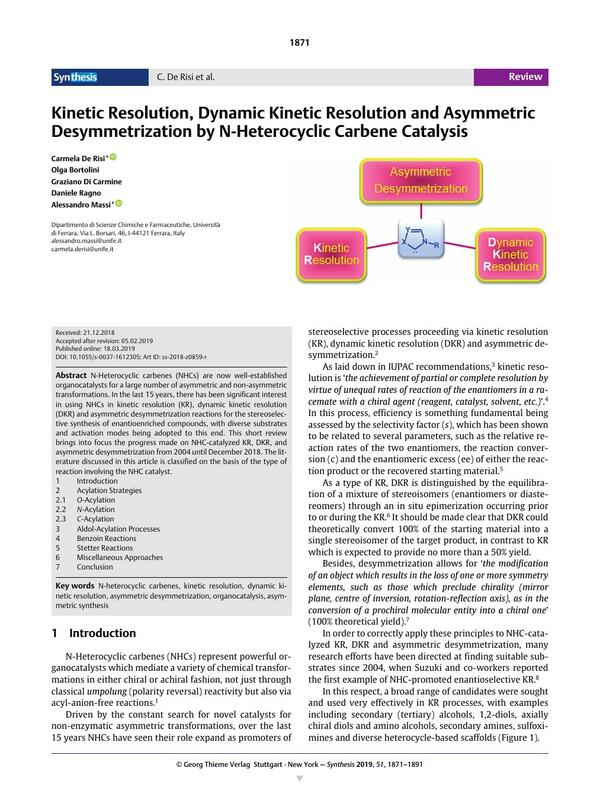 In the last 15 years, there has been significant interest in using NHCs in kinetic resolution (KR), dynamic kinetic resolution (DKR) and asymmetric desymmetrization reactions for the stereoselective synthesis of enantioenriched compounds, with diverse substrates and activation modes being adopted to this end. This short review brings into focus the progress made on NHC-catalyzed KR, DKR, and asymmetric desymmetrization from 2004 until December 2018. The literature discussed in this article is classified on the basis of the type of reaction involving the NHC catalyst.